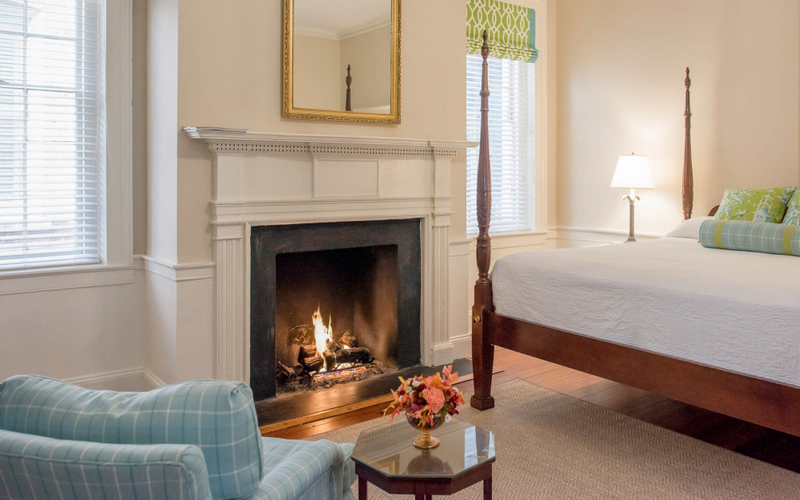 Blending the intimacy of a bed & breakfast with the thoughtful amenities and personalized service of a boutique hotel, the Kings Courtyard Inn is a rare find on Charleston’s celebrated King Street. Tucked within one of the city’s oldest buildings, this charming inn in the heart of the Antiques District features 41 freshly updated guest rooms and suites, including some with original fireplaces, four-poster mahogany beds and views of leafy interior courtyards. An unmatched location on iconic King Street. An intimate setting with three picture-perfect courtyards. Guest rooms with original architectural features. Gracious nods to Charleston traditions, including evening sherry. Built by Colonel J. Charles Blum, the inn occupies one of the oldest buildings on King Street. Designed by Francis D. Lee, a noted Charleston architect, its Greek revival style was accented by Egyptian architectural detailing. In the 19th century, the first floor of the Blum Building housed shops while the second and third floors were used as a hotel. Following the Civil War, King Street fell into a long decline. The war's devastating effect on the Southern economy changed the character of the building's shops. Over the next century, its uses varied considerably, including Singer Sewing Machine, a Salvation Army for lodging women, a dry cleaner, and even a skating rink. A complete renovation of the building included the creation of two courtyards with surrounding rooms, simply by uncovering and enlarging two light wells of the original building. Floors were refinished, windows were replaced, and modern bathrooms were added. The Kings Courtyard Inn became a charter member of Historic Hotels of America. 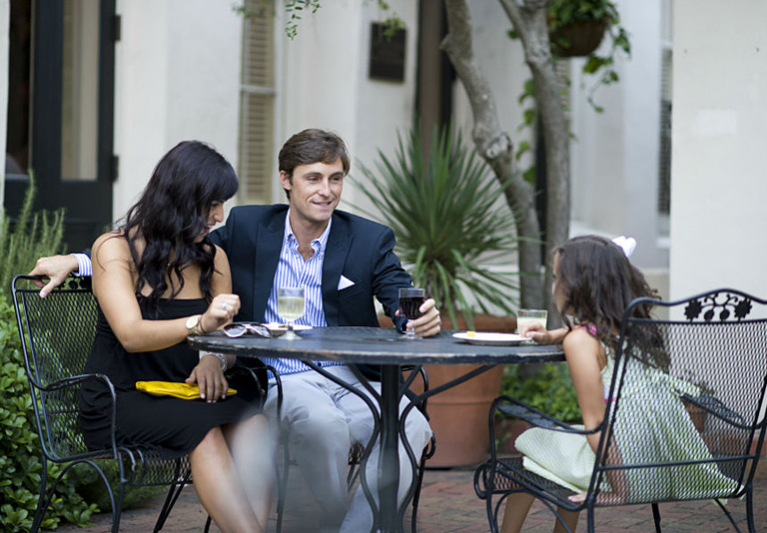 As family-owned hotel, we delight in welcoming families to our historic gem on Lower King Street, located just a mile from such family-friendly attractions as the South Carolina Aquarium and the Children’s Museum of the Lowcountry, and a short trip to the sandy shores of Sullivan’s Island. The Holy City’s rich history surrounds and envelops our guests. 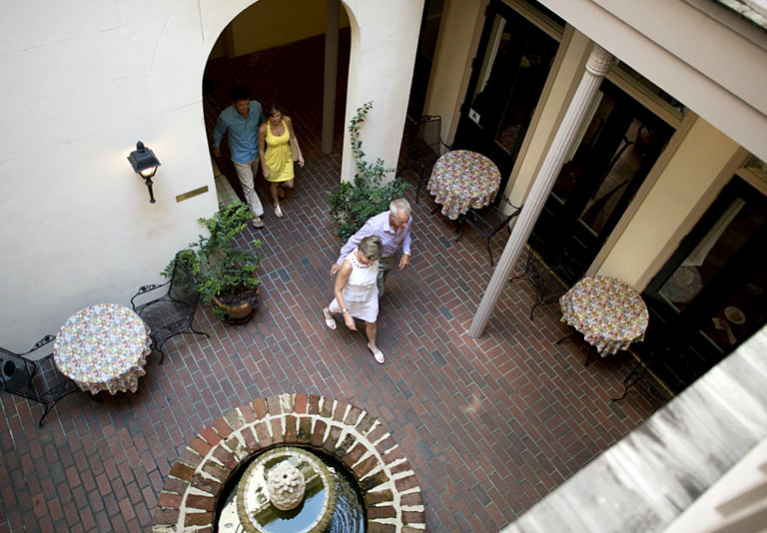 From our own landmark building dating back to 1853 to a heart-of-downtown location just steps from the Historic Charleston City Market and Preservation Society of Charleston, our Lower King Street address is a favorite of history buffs.